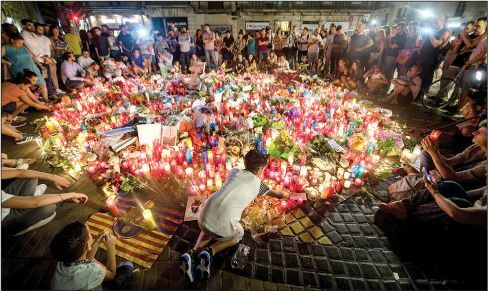 On a splendid, warm afternoon last week, Barcelona became “the victim of barbarians,” said Esther Vera in Ara. La Rambla, the city’s main pedestrian boulevard, was full of tourists and locals when a van smashed into the crowd, swerving back and forth as the driver aimed his vehicle at innocents. Thirteen people were killed—the youngest 3, the oldest 80—and more than 120 were injured. Hours later, a car rammed pedestrians in the quiet seaside resort town of Cambrils, 75 miles to the southwest, killing one. Five Islamist terrorists emerged from the vehicle wearing fake suicide belts; all of them died in a shoot-out with police. ISIS quickly claimed responsibility for the attacks, and it now seems the fanatics had hoped to spill even more blood. A makeshift bomb factory set up in an abandoned home in Alcanar, a town some 60 miles southwest of Cambrils, exploded the day before the attacks. In the ruins, Catalan authorities found 120 gas canisters, which the terrorists had intended to detonate during their vehicle attacks. They also discovered the remains of the gang’s suspected leader, Abdelbaki Es Satty—a former imam from Ripoll, the hometown of most of the other 11 suspected cell members. Es Satty picked his recruits cleverly, said Nacho Carretero in El País. The Ripoll terrorists, ages 17 to 34, were all of Moroccan origin. They had jobs or were in school, were fluent in Catalan, and were not known for extreme religiosity. Es Satty “opted to radicalize those least likely to be suspected.” But while these young men were seemingly well integrated into Spanish society, a cousin of two of the terrorists said, they had grievances the imam could exploit. “At school we were the Moors,” the man said, “and the girls did not want to go out with us.” Islamist terrorism in Spain “often carries a Moroccan passport,” said Florencio Domínguez in La Vanguardia. Of the 69 alleged jihadists arrested here over the past year, 31 are citizens of Morocco; another three are Spaniards of Moroccan origin. And the threat from extremists of Moroccan origin will only grow: Up to 1,700 Moroccans have moved to Syria and Iraq to fight in the ranks of ISIS. As the extremists’ self-declared caliphate crumbles, many of those militants will head to Europe to continue their holy war.